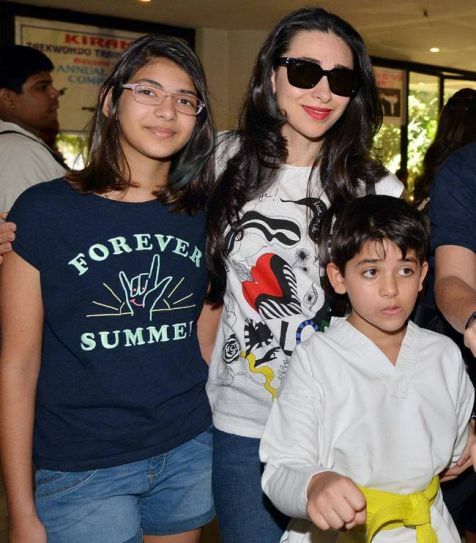 Karisma brings son Kiaan for lunch date with friends. Homekarishma kapoorKarisma brings son Kiaan for lunch date with friends. Just like us, celebrity kids too love to tag along with their mums to events, movies and lunches. Karisma Kapoor’s son Kiaan was spotted with her at Mumbai’s favourite haunt, Bastian restaurant on Sunday. The duo enjoyed lunch with his mother’s friends Malaika Arora, Amrita Arora and others. Malaikas’ son Arhaan. They were spotted outside the restaurant by paparazzi. Karisma was seen in a white T-shirt and black jeans while Kiaan looked smart in his T-shirt and bermudas combo. Malaika was seen in a cropped white shirt and blue high waist jeans. Also spotted at Bastian were Khushi and Rhea Chakroborthy. Khushi wore a pair of black sweat pants and a simple tank top. Rhea looked like a summery princess in her black and yellow floral sundress. Stars who were spotted at the airport included Shweta Bachchan Nanda, Sonam, Parineeti and Arjun Kapoor and Sushmita Sen. The stars were all dressed more casual than usual. Aishwarya Rai returned from Doha, Qatar with her daughter Aaradhya. She was there for Manish Malhotra’s fashion show. Akshay Kumar and Twinkle Khanna were also seen at the airport with their daughter Nitaara.